The Best Park in Town! Two Suns Are Better Than One! Welcome to 'Meet in the Park'! Teachers, and students, this is your space on the Park Explorer website - the place where you can share your ideas and good work with everyone else! Have you found out something really interesting about your local green space? Taken a good photograph? 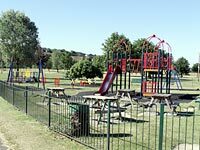 Done some good writing or art work about your park that you'd like other people to see? Then please send it to parky@parkexplorer.org.uk and we'll put as much of it as we can on to the website for everyone to enjoy and be inspired by. For details of technical formats required, please click in the panel on the left.